The children use papier mâché to create charming birds. For ages 6 to 9. Plan 4 sessions. Cut newspaper sheets into quarter-sized pieces. Set out tape, scissors, and pieces of cardboard. 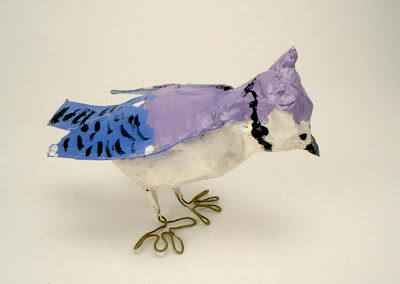 Explain to the children that they will be making three-dimensional, or free-standing, birds with papier mâché, a process using paper and paste. When the paste-soaked paper dries, it becomes very hard and can then be painted. In this session, they will be forming the birds' bodies with wadded newspaper. In the next session, they will be applying the papier mâché. While looking at the pictures, discuss the shapes of the birds and how their heads and bodies are joined with very little definition at the neck. Standing birds have their wings against their sides, rather than outstretched, and their claw-like feet are visible. Point out the many different types of tails and beaks. Demonstrate how to make a bird’s body. Have ready several strips of tape. Tightly wad together individual pieces of newspaper and hold them in place with the strips of tape. Add more wadded newspaper with tape until reaching the desired size. For the bird’s head, make a smaller shape and attach it to the body, keeping in mind that birds don’t have very defined necks. Cut two wings and a tail from cardboard. Attach the wings along the sides of the bird, taping on top of as well as underneath the wing for a stronger connection to the body. Make sure the tape follows the contour of the wings so they won't be lost when the papier mâché is applied. Tape the tail to the back of the bird. The beak will be made with papier mâché in another session. Note: Keep the abdominal sections of the birds' bodies about the size of an adult fist, so that they don't become too heavy to be supported by the wire used for the birds' feet, which needs to be thin enough for the children to bend easily. Prepare a space with a non-stick surface, such as waxed paper, for the birds to dry. Twist and wad pieces of aluminum foil to support additions while drying. Explain to the children that, in this session, they will be applying two coats of papier mâché to their birds. 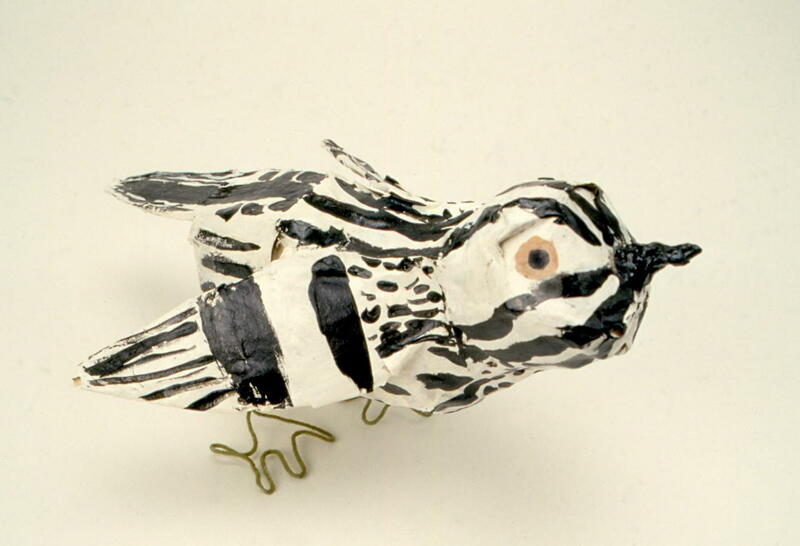 Demonstrate the papier mâché process by dipping strips of torn newspaper into the prepared paste. Pull the wet strips between two fingers to remove the excess paste. This step is important to avoid having the bird become too wet. Lay dampened strips on the bird foundation, overlapping or extending over the piece next to it, and smoothing the edges as you cover the entire body with one layer. To keep the form of the wings and tail, carefully wrap the papier mâché around them. As the children start to apply their papier mâché, warn them that the first coat is the hardest. The second coat is easier because the paste-soaked paper will stick to itself. When the birds are covered with two coats of papier mâché, put each child’s name on a small piece of paper with a permanent ink marker and paste it directly to the wet bird. Note: Dry the birds on a non-stick surface, such as waxed paper. Wedge a small wad of aluminum foil under areas that need support while drying. Cut the wire into pieces approximately seven to ten inches. Plan two for each bird. Set out the dried birds, cut wire, and glue. Have available a skewer to make the holes for the birds' legs. This is best done by an adult. 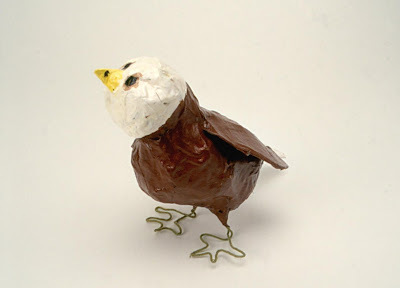 Explain that, in this session, the children will be adding the birds’ legs and applying a final coat of papier mâché. Show how to bend the wire into claw-like feet. Starting at the top of the leg, go down to form the claw, and continue back up to the top of the leg. Poke holes in the bird’s body where the legs will go. Stick the tops of the legs into white glue and then into the holes in the body. Secure by wrapping a small piece of papier mâché around the top of the leg where it connects to the body. Bend the legs and claws of the feet to balance the bird. After the legs are attached, have the children put a final coat of papier mâché on their birds. Remind them to overlap and smooth the surface so it will be easier to paint. When completed, the children should dip small pieces of newspaper into the paste, shape them into beaks, and attach them to the birds' heads. Set out the dried birds. Display the pictures of the birds again. Explain to the children that, in this session, they will be painting their birds. While looking at the pictures, discuss the many colors and patterns on the birds, the circular shape and placement of their eyes, and the colors of their beaks. Tell the children that they may use the colors of a specific bird or create their own. 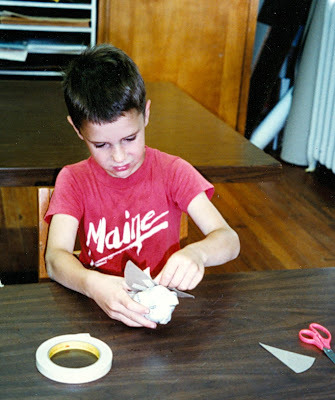 Show the children how to paint the rough edges of the dried paper mâché. Load the brush with paint and dab into the crevices. Smooth over the area so as not to leave puddles of paint. The children should avoid painting the legs because the paint will chip off the wire. Give the children paint and brushes and let them create their aviary. Note: A coat of polyurethane will give strength and protection to the birds, but must be applied by an adult. Be sure all attachments are secured with tape before getting the foundation wet with paste. If the birds lose their balance after they dry, adjustments can still be made to the claws. Looking at the birds, discuss the variety of shapes and colors. Are the birds able to stand alone and viewable from all sides? Review with the children the process they used to make their birds. If I let go of my wadded pieces to put on the tape, it will fall apart. The papier mâché keeps falling off my bird. My bird is dripping wet and starting to fall apart. My bird is so bumpy my paint brush keeps missing spots. My bird is wobbly and keeps falling over. It's best to pull some strips of tape before you start wadding your newspaper. If you forgot, ask the person next to you for help. Remember that the first coat of papier mâché is the hardest. 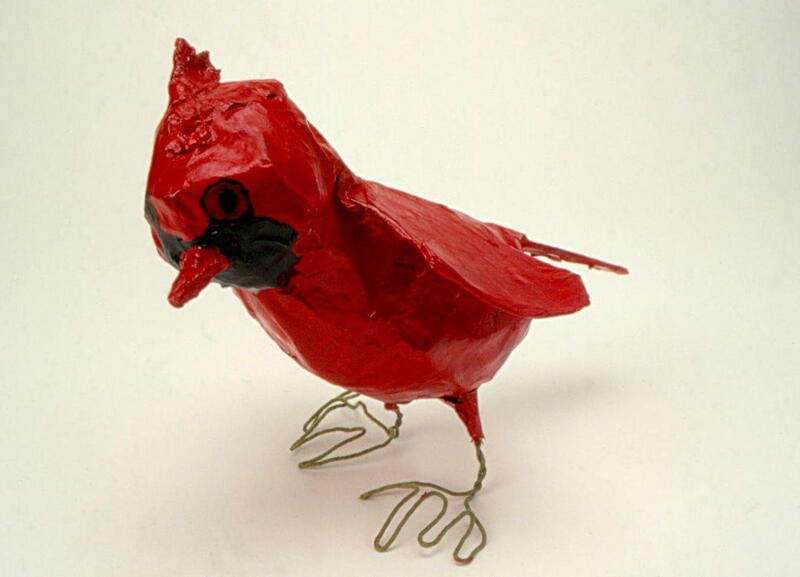 Once the papier mâché meets itself on the other side, it will have something to stick to and will stay on your bird. Remember to pull the wet newspaper strips through your fingers to take off the extra paste. If your bird is too wet, try putting on a layer of dry newspaper to soak up the extra paste. You need to fill your brush with paint to dab it into the bumpy areas. Brush away any extra paint to avoid puddles which might chip off after the paint dries. Let me help you bend the wire claws to balance your bird.